Do you often find that you're still hungry after eating a bowl of soup? What if you could also eat the actual bowl? 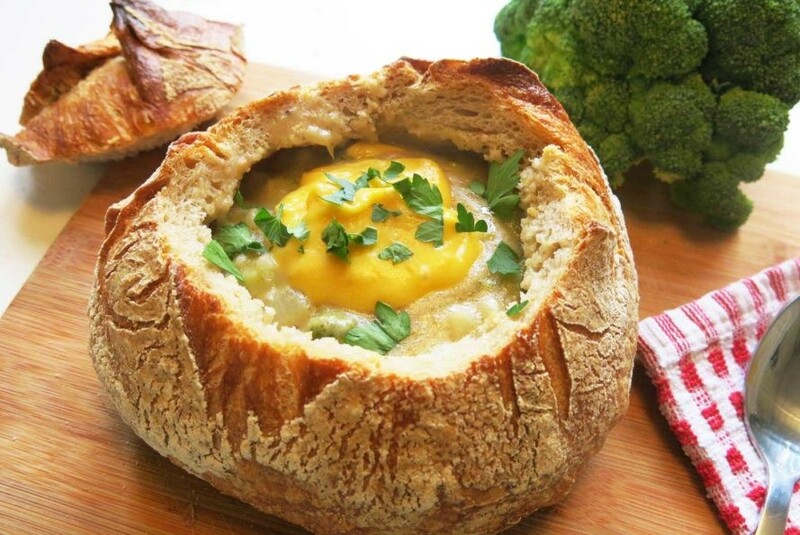 This deliciously cheesy vegan broccoli soup is served inside a hard-crust bread roll, with an emptied interior to be eaten along with the soup. That means no extra dishes to wash! It comes complete with a dollop of dairy-free, vegan nacho cheese for extra creaminess to satisfy kids and adults alike. Add olive oil to a large pan over medium heat (350°F), then chop and add the onion. Cook and stir for 3 minutes. 3. Add the soup ingredients. 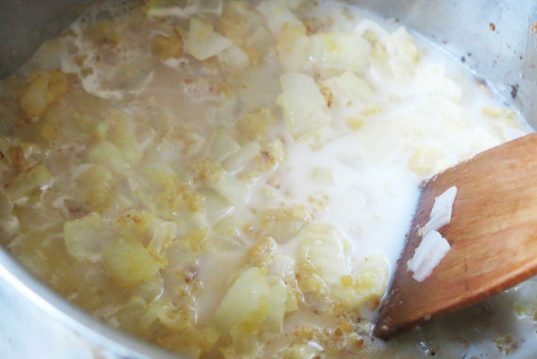 When the onions are turning gold, add the milk (we use rice milk) and stir. 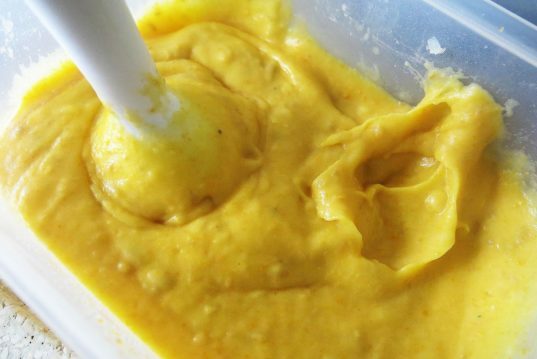 If you want the soup thicker, add a few spoonfuls of nutritional yeast flakes or flour, but make sure you whisk constantly for a few minutes until combined. Add the broccoli florets, 2 glasses of water, stir and then cover the pan. 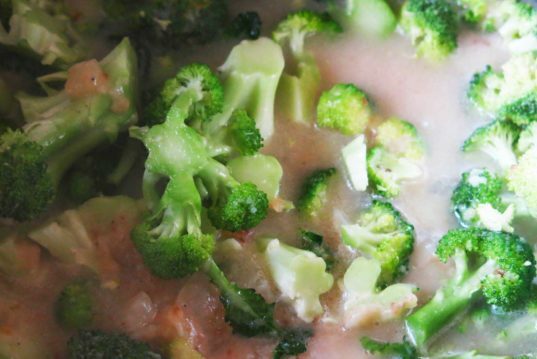 Reduce the heat to low (150°F) then simmer until it’s thickened and the broccoli is tender, 20 to 25 minutes. 4. Make the vegan cheese. 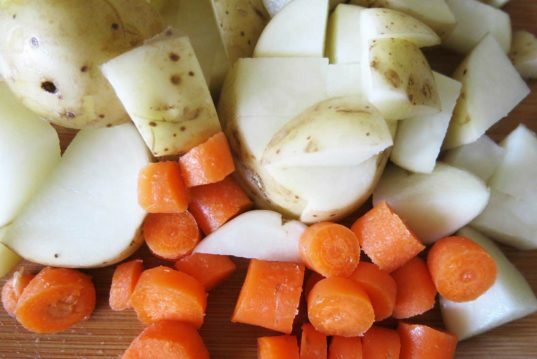 Wash and chop the potatoes and carrots into small pieces. Boil in water until tender. Drain and place in a bowl along with a chopped garlic clove, salt, olive oil, lemon juice and water. Process until you get a creamy cheesy texture. You can play around with consistency by adding water or yeast flakes. See the full step-by-step recipe here. At an angle, cut off the top third of the bread and remove the ‘lid’. 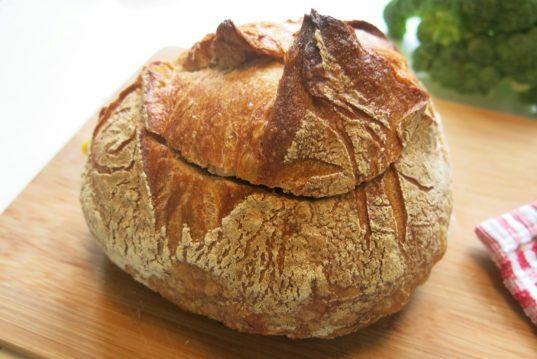 Then tear out chunks of bread, leaving a ½-inch rim around the crust. Pour in the broccoli soup once it’s ready and not too hot, add a dollop of ‘cheese’ and serve with the lid on to keep it warm. 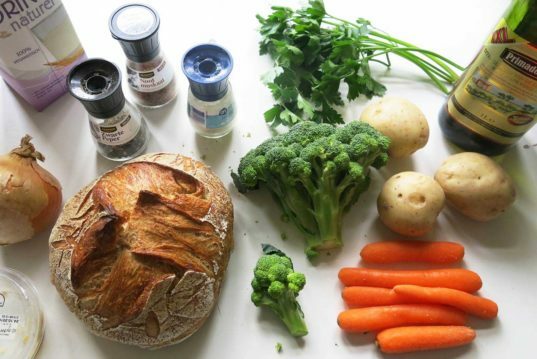 At an angle, cut off the top third of the bread and remove the 'lid'. 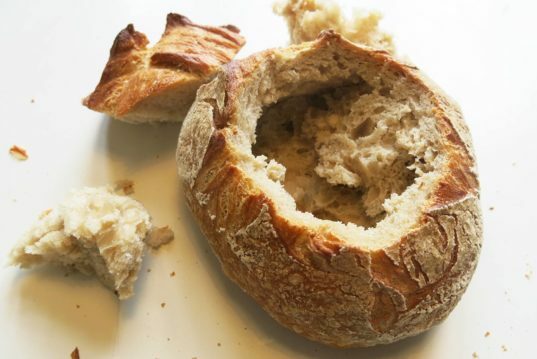 Then tear out chunks of bread, leaving a ½-inch rim around the crust. h2>7. Serve Pour in the broccoli soup once it's ready and not too hot, add a dollop of 'cheese' and serve with the lid on to keep it warm.